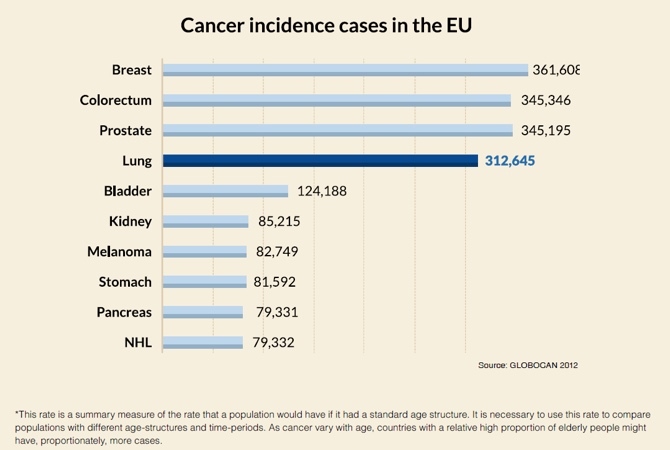 This year, more than 310,000 adults all over Europe will be diagnosed with lung cancer. 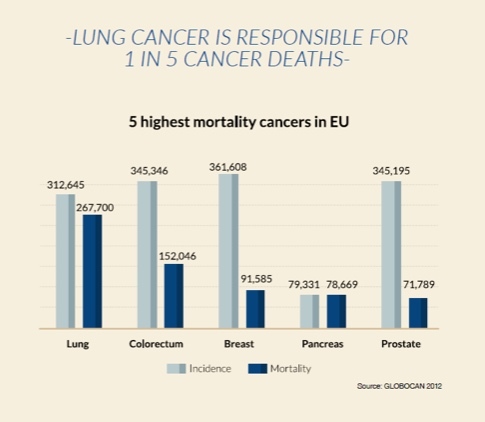 Lung cancer is literally the biggest cancer killer worldwide – causing more deaths than breast and prostate cancer put together all over the world. To sum it up every 30 seconds, someone, somewhere in the world dies of lung cancer. The 5-year survival rate tells you what percent of people live at least 5 years after the cancer is found. Presently it’s approximated at 18 %; respectively 15 % for men, 21 % for women. Not surprisingly, lung cancer has the lowest 5-year survival rate of the other most common cancers: only 18 %, versus prostate at 99 %; breast at 89 %; and colorectal at 65 %. Lung cancer is one of the most common cancers affecting both men and women in Ireland. About +2,500 people are diagnosed with lung cancer annually. More people die from lung cancer in Ireland than any other type of cancer. Lung cancer is the fourth most common cancer in Ireland after prostate, breast and colorectal. 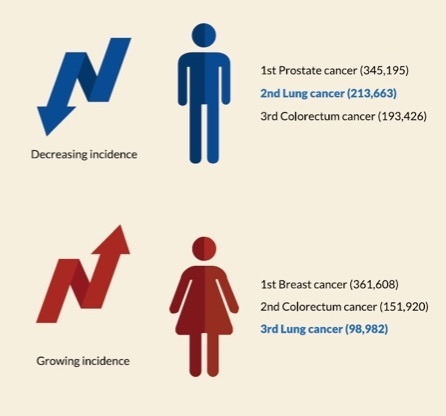 The incidence of lung cancer is currently decreasing for men but increasing for women. Less than 1% of all new cases occur before the age of 40. Smoking avoidance/cessation is the most important preventative strategy as over 90% of lung cancer can be attributed to cigarette smoke. However lung cancer can occur in patients without any of the listed risk factors. The lungs are two organs found in your chest and form part of your respiratory system. This system is responsible for your breathing. The right lung is slightly bigger than the left and contains three areas called lobes. The left lung contains two lobes. 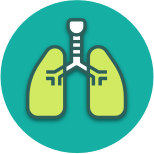 When you breathe in, air passes through your nose or mouth into your trachea (windpipe) and separates into two further tubes (bronchi). Each of these bronchi connects to a lung. The bronchi divide even further into much smaller tubes called bronchioles. Air passes through these bronchioles and into tiny air sacs called alveoli. In the alveoli, oxygen is absorbed from inhaled air into your bloodstream and is sent around your body. Oxygen is needed in every cell of your body for various activities. During these activities, the waste gas, carbon dioxide, is made. It passes back through the alveoli and leaves your body when you breathe out. When cancer develops in the lungs, the cells change and grow in an abnormal way. 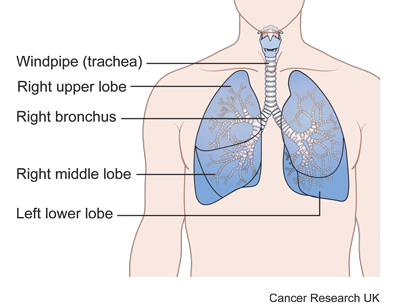 Many lung cancers begin in the wall of the bronchi. As the cancer grows it forms a collection of cells (tumour). This tumour can then cause a blockage and result in symptoms, for example, difficulty in breathing. The Marie Keating Foundation, in association with MSD Ireland, hosted an event "Lung Cancer: Awareness, Stigma, Inequality" to highlight new research commissioned by the two organisations which shows a significant knowledge gap amongst the general public when it comes to lung cancer. Read key findings from our 2017 research study by clicking here.